(Bloomberg) -- South Africa’s performance on a range of social, economic and governance measures deteriorated more in the past 12 years than any other nation not at war, according to Eunomix Business & Economics Ltd. The decline is likely to continue as the country wrestles with the consequences of nine years of worsening corruption and policy paralysis under former President Jacob Zuma, the Johannesburg-based political-risk advisory company said. The fragility of the economy may also limit the tenure of his successor Cyril Ramaphosa, who faces his first national election on May 8, it said. An index of security, governance, prosperity and welfare indicators shows South Africa slumped to 88th out of 178 nations in 2018 from 31st in 2006, according to an analysis of the country’s prospects by Eunomix. The company advises some of the biggest mining companies operating in the country. South Africa’s decline in ranking is only been superseded by conflict-riven countries such as Mali, Ukraine and Venezuela and its peers now include Colombia, Jamaica, Latvia and the Philippines, compared with Portugal and Slovenia in 2008. Other advisory groups, such as FTI Consulting, are more positive on South Africa’s prospects. Eunomix disagrees, saying the likelihood of arresting the decline is limited by the unsustainable structure of South Africa’s economy, in which economic power is largely held by an elite that wields little political influence, a product of its apartheid history and its status as one of the world’s most unequal societies. The ability of politicians to make the unpopular decisions needed to boost growth is hampered by this imbalance. While Ramaphosa spent his first 14 months in power pledging a crackdown on corruption, an end to policy uncertainty and a drive to reform loss-making state-owned companies, his political weakness will hinder or thwart progress, the company said. 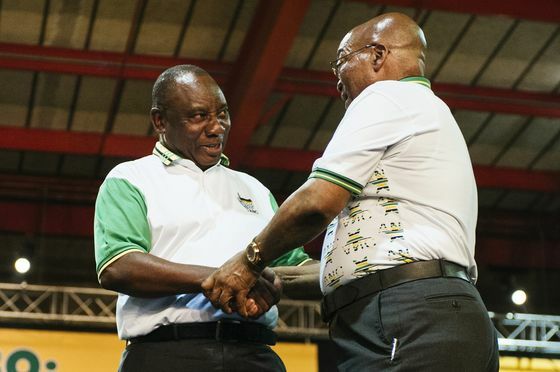 Ramaphosa won the leadership of the ruling African National Congress in December 2017 in a contest with Zuma’s ex-wife, a political ally of his, by a narrow margin, and the party remains riven by factionalism. Orthodox economics adopted during the rule of former President Thabo Mbeki, who was in power from 1999 until 2008, have been abandoned in favor of more populist policies. They include a drive to adopt land expropriation without compensation, free tertiary education and more stringent black economic empowerment requirements for mining companies.